Freestanding Digital Signage is a great way to make an instant and obvious impact, with large scale screen sizes, and fantastic modern styling you can be assured your content will be seen and heard. Available with touch capabilities, networked, and outdoor options providing the ability to suit any set of requirements needed. 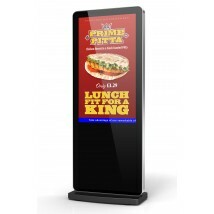 Freestanding digital signage has a multitude of uses and can be seen in restaurants, exhibitions, shopping centres, conferences, cinemas, showrooms, stores and fast food establishments. 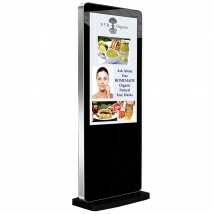 This is because it can display your content on its screen, giving a great visual representation of any information you may wish to give such as a menu or ordering system. Outdoor option: Our choice for anyone looking for a screen to be used in high traffic areas, or where it will be exposed to harsh weather conditions is our outdoor freestanding display. Offering weatherproofing to an IP65 rating, an ultra bright anti-reflective screen, and vandal proofing, it is perfect for any public displays, such as; shopping centres, showrooms, exhibitions, conventions, city centres, and public transportation. Providing you with peace of mind. 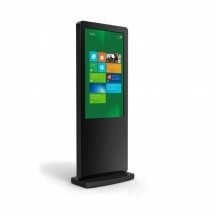 Touchscreen option: To give full immersion and interactivity for users our Dual-OS touchscreen display is perfect. Featuring both an Android and Windows operating system, this allows for the widest possible range of supported media and applications. 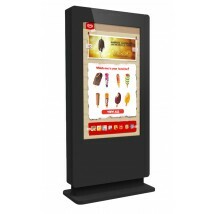 With the IR touchscreen, you can allow touch interaction, perfect for shopping centres, or showrooms, allowing the customer to look at various options, and browse your store's inventory. It may also be used for many other uses, including office environments, and doctors surgeries for checking in and booking appointments.